Fractured Earth: Fractured Lives. A half hour impassioned documentary film about the shale gas industry in Pennsylvania and the controversial process of fracking (hydraulic fracturing). Photojournalist Lee Stone sets out to consult with a handful of locals in the towns of Dimock and Towanda, PA, where the fracking industry has wreaked havoc. Through first-hand accounts we learn about the struggles working-class Pennsylvanians have endured at the hands of the natural gas industry since 2008. The drop in the global price of oil has forced the industry in the US to slow production, putting an estimated 100,000 oil and gas workers out of work. The film follows photographer Les Stone as he revisits people whose stories he has been documenting for the past 5 years. The focuses on the current economic woes that the industry faces and also looks at the communities that believe that they have been adversely by the shale gas process, including those that supported the process and hoped to make money from royalties from the gas pumped from their land. Hydraulic fracturing involves drilling into the Earth and penetrating the shale layer by inserting a high-pressure combination of water, sand and chemicals into the ground in order to crack it apart and release natural gas. Accessing these natural gasses is meant to lessen our reliance on foreign oil by providing an affordable domestic resource, but the ultimate cost to locals is revealed to be devastating. Throughout the film average citizens share their tales of polluted water sources and corporate intimidation. Fractured Earth leaves very little room for a pro-fracking argument, making an incriminating case against the natural gas industry and its proponents. 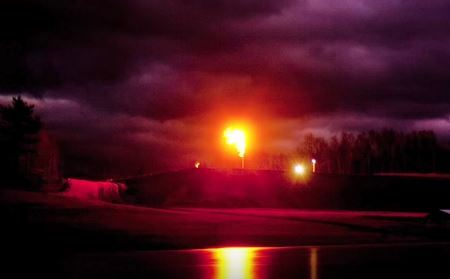 Natural gas is not a “bridge fuel to the future.” It is a death sentence for humanity. Think that is too strong? Think again. A new study by the Environmental Defense Fund finds that methane escaping from fracking operations in Pennsylvania “causes the same near term climate pollution as 11 coal fired power plants” and is “five times higher than what oil and gas companies report” to the state.